Recommended Citation: Ricks, J, E Henry, D Schwieger, and A Almosen. 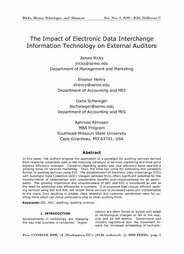 The Impact of Electronic Data Interchange Information Technology on External Auditors. In The Proceedings of the Conference on Information Systems Applied Research 2009, v 2 (Washington DC): §3124. ISSN: 0000-0000. In this paper, the authors propose the application of a paradigm for auditing services derived from relational constructs used in the maturing paradigm of services marketing and third party logistics efficiency concepts. Concerns regarding quality and cost efficiency have spurred a growing focus on services marketing. Thus, the time has come for extending this paradigm further to auditing services using EDI. The establishment of Electronic Data Interchange (EDI) with Automatic Data Collection (ADC) linkages between firms offers significant potential for the transformation of relationships with considerable benefits and responsibilities for all participants. The growing importance and ubiquitousness of ADC and EDI is considered as well as the need for additional cost efficiencies in business. It is proposed that unique, efficient auditing services using EDI and ADC will render those services of increased value and indispensable to the client, thus resulting in greater client retention and customer satisfaction rates for auditing firms which can prove particularly vital to small auditing firms.